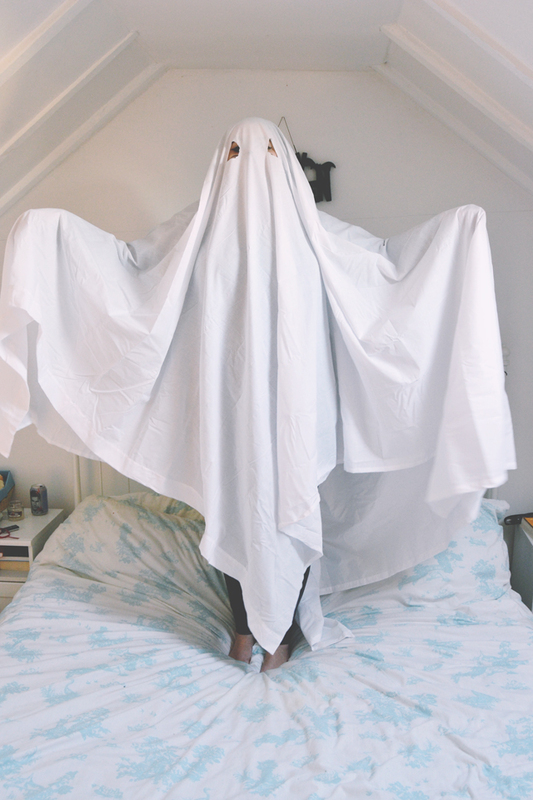 A couple of days ago, I wrote about my amazingly inventive, creative and labour-intensive ghost costume. Now that I've worn this look to a club, I never want to wear anything else again! Here are all the fantastic things about clubbing as a ghost. The sheets are surprisingly tiring on the arms. Hello muscles! Ok, so it was ridiculously hot, people kept stepping on me, the sheet constantly slipped so my eye holes were all over the place and, even when they were in place, I had tunnel vision but it was so much fun! Everybody should dress as a ghost at least once in their lives. You had me totally convinced of being a ghost next year, until I read the cons at the end. Still, it is a wonderfully ironic costume, and I still might dress up as one in the future. haha way to go, this is awesome. I think this would be a useful outfit for life in general sometimes!! Hahaha love this post! I had a bit of a bad experience with said creeps at the weekend, so maybe I'll don the sheets next tim I'm out! Ahahaha what an awesome idea! It's so unoriginal it's original, if that makes any sense. I may need to be a ghost one year. The benefits sound like they far outweigh any cons! Sounds like the perfect night out!